This entry was posted in Ethiopian adoptees, Hana Alemu, Hanna Williams, Larry and Carri Williams, Washington state and tagged abuse, adoptees, adoption agencies, adoptive parents, international adoption, Skagit County Washington by Light Of Day Stories. Bookmark the permalink. The one thing I think should happen with adoptions is that someone should check on the kids longer than just a year. Take the children aside for an interview without the parents. I fear for children who are isolated by being homeschooled and not allowed to take part in community sports or even church events. If no one sees them but the family, this kind of thing can happen. I know we all make parenting mistakes–reacting too quickly, overreacting or not choosing the best discipline (two of mine didn’t trick or treat tonight because of poor behavior and lying about it, but they got a snack and a warm bed, yet people tell me I’m too hard on them)–but torture and starvation should never happen. And home visits and interviews with the kids might help with that. The defense witnesses did not do the defense any favors. They seemed as deluded as Carri Williams. Describing the Williamses as good parents, is like describing Ted Bundy as a wonderful date. Just like Carri, they blamed Hana for her own death because of “behavior problems”. The defense should have coached the witnesses. They should have said that the Williamses were good well intentioned people who got into a religious movement, and they bought into something they now know is very wrong. If they could go back and do it over, they would do everything differently. They should have blamed the Christian discipline books. The judge must have been livid to hear the same twisted thinking from the witnesses. It reminds me of the Mark Jensen murder trial. Jensen was convicted of poisoning his wife so that he could run off with his lover. The children of the murdered woman wrote a letter to be read at sentencing where they referred to their slain mother as their “birth mother”. The judge was horrified that the children had been so alienated from their murdered mother. Thanks again for your careful and accurate reporting on this tragic story. Thank you also to Judge Cook for understanding the torture and degradation that Hana and Immanuel went through and giving the Williamses the longest sentences she could. A question: Maureen, as you were in the courtroom, do you know about the structuring of the sentences? I’m told that Washington State does not have parole, but I’m concerned about a “split sentence.” To clarify the question, will Larry and Carri Williams spend the whole of their sentences in custody (prison) or did the Judge say that they will spend some part of the sentence in custody and then possibly spend the rest of the sentence on probation? Of course this battle isn’t over yet. Carri and Larry Williams will be appealing both the convictions and the sentences. We have to keep monitoring this case. Good questions. I know there were a lot of documents signed at the end of the sentencing hearing, but I haven’t heard any specifics. I don’t know, for example, if Larry got credit for the two years he already spent in jail. I’ll see what I can find out and post when I have the information. Thanks for your comment. I am not a lawyer, but have known people who went to prison. Typically, people get credit for “good time” and can get as much as 1/3 off their sentence if they do not get any “infractions” in prison. They have to go in front of a board to plead their case to get out early. But the people who were wronged can attend those hearings also. And they are monitored after they leave, or sent to a halfway house. Larry MAY have gotten credit for “time served” because that is also typical. In fact, if he did not, his lawyers would have objected loudly! Thank you. This is helpful. I agree completely that if it’s typical in washington state to get credit for time served, Larry’s lawyers would have made certain that it happened. Your point about reduction of sentencing time is important too, and speaks to what Gillian and others have said about monitoring the appeals, the time served, potential hearings on release, and so on. One thing I left out, because I just remembered it, the possibility that they will ask for a pardon. This wouldn’t happen anytime soon, I would think, but given their lack of understanding of what THEY have done, who knows. As with a parole hearing, they have to plead their case to a board and then the board recommends to the governor. People HAVE been released from prison through pardons. I am betting that down the road, when things have “faded”, their friends, family and lawyers,.will try this also. Thank you for bringing this trial to those of us who couldn’t be there, along with your wise perspective on international adoption. Have you heard whether the Williams’ adoption agency will face additional scrutiny and/or sanctions? I just don’t understand how the Williams could have passed a home study given how sick they would have had to be to abuse a child to death. It’s very unlikely that the agency–Adoption Advocates International–will face additional scrutiny. These crimes occurred well after the Williamses had full legal custody of Hana and Immanuel, so technically (though I’m not a lawyer) the agency no longer had any legal responsibility. That said, it is my hope that agencies and policymakers will look long and hard at the screening and preparation of prospective adoptive parents, as well as what kind of post-adoption services are available to families. There were a lot of red flags in this adoption. Feel free to look at my July 15 post called “Reflections on Hana: Acknowledging the Failure of the Adoption Community,” and my “Case Study: The Williamses’ Adoption Agency,” Part 1 August 7 and Part 2 August 8. I plan to continue to speak out about it. This is critical: AAI acted perfectly legally, within the scope of its licensure, in approving this family to add children #7 & #8 (?is that right?) whom they had observed on video for a few minutes. In the immortal words of Chris Rock, ‘That tiger didn’t go crazy; that tiger went tiger’. It was always predictable that the parenting tactics practiced by a family like this–abusive, controlling and completely inappropriate for post-institutionalize children–would result in a child’s actual physical death at some point. Nothing that is prohibited by state or federal law occurred. Isn’t that the problem, right there? To Alex King’s point: I can’t see that AAI did anything illegal. Hana and Immanuel were children 8 and 9. There is much research that shows what disciplinary approaches work and do not work with traumatized and/or post-institutionalized children. Corporal punishment, even as it is allowed under state law, is usually at the top of the list of disciplinary approaches that do not work with these children. Spanking, for example, is allowed in Washington state. It was a technique that Larry and Carri had apparently used successfully with their 7 biological children. And when it didn’t work with these older, adopted children from another country, the techniques just got crueler. I’m still struck by the fact that the behaviors that Carri was trying to change were not things like abusing other children, setting fires, hurting pets, damaging property–it was ‘stealing” junk food, which is also very common behavior of post-institutionalized children. It was writing capital letters in the middle of words, or not saying thank you the right way. I have to wonder about the screening, preparation, and post-adoption process, how much Larry and Carri really understood about the realities of adopting older children, how much they were willing to seek out support and resources from the Ethiopian and adoptive community–those are the areas where so much fell so tragically apart. I’m not sure how much Larry and Carri Williams were capable of understanding about adopting older, international adoptees. As you point out in your other posts, they had never been to Ethiopia. Had they ever even left the country? Did either of them speak any foreign language? My guess is that their capacity for empathy was limited and no amount of additional required reading or training would have changed that. The screening has to get better to filter out sadists, narcissists, or whatever Larry and Carri are (though I hate to play armchair psychologist). Until then, there is no guarantee that the next set of parents won’t be exactly like the Williamses and the tragedies will continue. I am as pleased as it is possible to be in the circumstances. 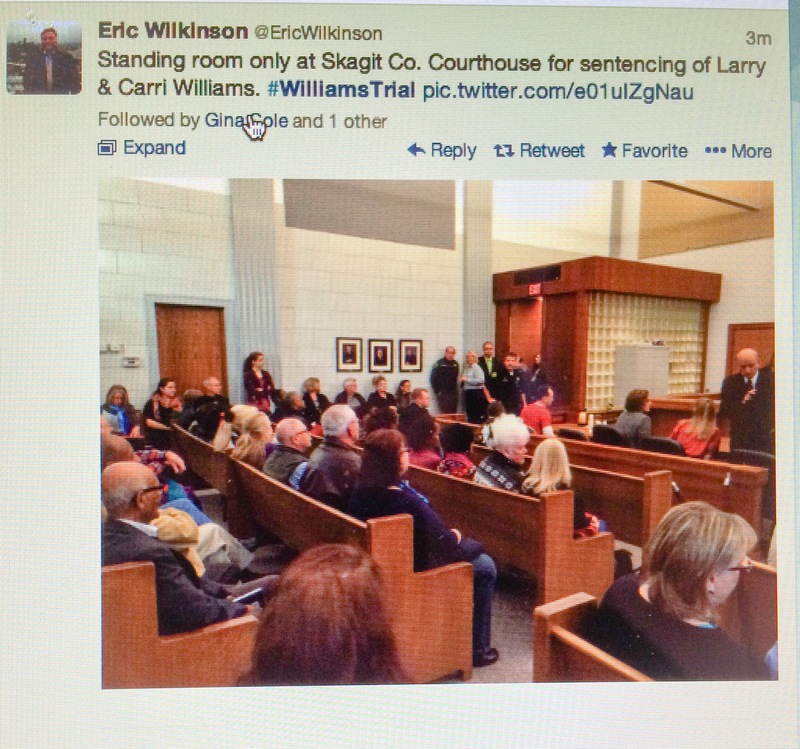 I was especially glad to see the judge take Larry’s role in the whole thing so seriously. That he wasn’t there at the time Hana died is no excuse to pretend he didn’t know what was going on. He has still not taken full responsibility for what he did or failed to do. His responsibilities for making those children’s lives a living hell is not to excused. He expressed remorse, after a fashion, but he also placed blame squarely on Carri. Maybe he didn’t see what he didn’t want to see. I was in any case a little surprised (as were others, I think) that his sentence exceeded even what the prosecution recommended. The judge indeed took the conviction seriously. Thank you Maureen as always for your precise thoughtful reporting. Deb, I too was struck by what the judge said about the Williams children, how they were taught by example that it is OK to degrade and abuse their adopted brother and sister. I hope these children receive counseling, to try to undo the damage done to them by their parents. And to Immanuel, I am thankful he is in a good, safe place now. May Hana rest in peace – justice can never fully be done until this type of adoption ceases. Thank you. My hope also is that some good comes from this tragedy. I hope so -perhaps we will see transnational adoption stopped or those with extreme views not approved to adopt. I am glad that the judge made these decisions. They say Carri is “not a danger” to the community. But she is a danger to children, as is Larry. Maybe someday, they will be able to fully take responsibility for what they did to Hana. One thing irks me, though. I keep seeing on news sites that they are “accused” of murder. NO! They are NOT accused, they are CONVICTED! Found GUILTY of murder and abuse. Absolutely they were convicted. Carri was found guilty by a jury of homicide by abuse, manslaughter, and first degree assault–of children. Larry was found guilty of manslaughter and first degree assault–again, of children. I still am amazed by Carri’s statement of the stand that she believed that Hana had accidentally killed herself. It’s just so sad, all around. It IS sad! It did not have to happen. And I just heard the judge’s comments during the sentencing regarding the Williams’ biological mchildren. On how they were taught that it is ok to degrade and abuse other human beings. Hopefully, those children will learn that it is NOT ok and will heal from this. And I continue to pray for Immanuel’s healing. It doesn’t feel quite right to use the words, “Good News” in any way regarding this murder and abuse trial, but if there can be any ‘good news’ here, this is certainly it. Thank you again for your diligent and thorough reporting and writing during and after the trial. I agree–there’s no joy in this at all, but there is a sense of justice. Thank you for your kind words.